可算名詞 [食べ物には 不可算名詞] プランタンの実 《料理用》. 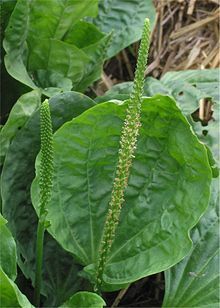 Borrowed from Anglo-Norman plainteine et al., Old French plaintain, from Latin plantāginem (“plantain”), accusative of plantāgō, from planta (“sole”), a nasalized form of Proto-Indo-European *plat (“flat; to spread”), because of the broad, flat shape of the plantain leaves. A plant of the genus Plantago, with a rosette of sessile leaves about 10 cm long with a narrow part instead of a petiole, and with a spike inflorescence with the flower spacing varying widely among the species. See also psyllium. The roots of Plantain and Pellitory of Spain beaten to powder and put into hollow teeth, takes away the pains of them. The paths too are overgrown, but easily identified by the presence on them of round-leaved plantains. From Spanish plantano, obsolete variant of plátano, from Galibi Carib platana (“banana”). A plant in the genus Musa, the genus that includes banana, but with lower sugar content than banana. The fruit of the plant, usually cooked before eating and used like potatoes. For quotations of use of this term, see Citations:plantain. Plantain (pronounced /ˈplæntɨn/ as in mountain; also UK: /ˈplɑːntɨn/ or the rarer US: /plænˈteɪn/) is the common name for herbaceous plants of the genus Musa. The fruit they produce is generally used for cooking, in contrast to the soft, sweet banana (which is sometimes referred to as the dessert banana). There is no formal botanical distinction between bananas and plantains, and the use of either term is based purely on how the fruits are consumed.